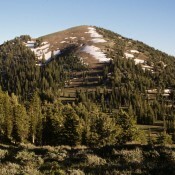 Sherman Peak is the 67th most prominent Idaho peak. Sherman Peak from the north. Sherman Peak is a behemoth. It is the highest peak in the Bear River Range and stands as a sentinel overlooking the northern end of the Bear River Valley. • Sherman Peak is not a Class 1 endeavor. There are no longer any trails to the summit. • Skinner Canyon Road/FSR-403 DOES still exist and skirts the base of the South Ridge of Sherman Peak on its east side. A Class 2 scramble up the South Ridge leads to the summit of Sherman Peak. There are only some faint remnants of a trail high up on the South Ridge of Sherman Peak. Lower on the South Ridge, there are no signs of a trail. 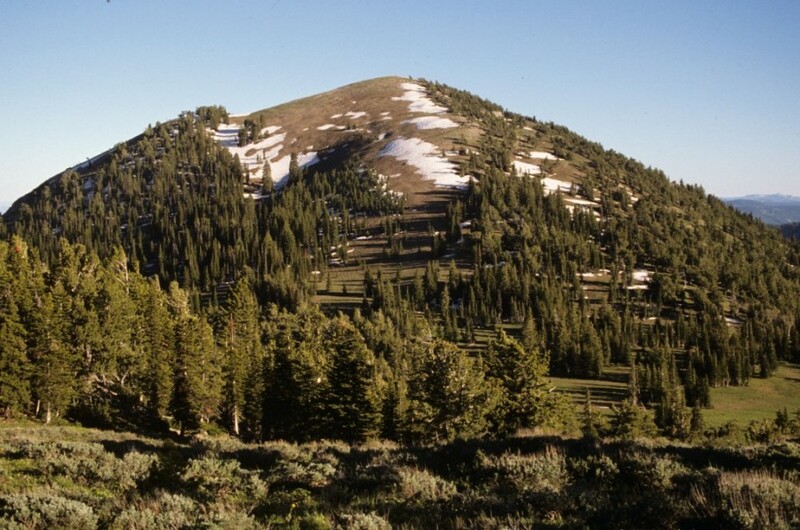 • The only trail on the northern aspects of Sherman Peak that exists today is FST-446 (an ATV trail), which begins on Eightmile Canyon Road at a signed trailhead about 0.4 miles above (S of) the turnoff for the old Eightmile Campground. The road crests at about 8,260 feet in a location that is NW of Point 8522. It continues NE to a junction with FST-317 at the head of the Mill Fork Eightmile Creek drainage. FST-446 ends here at a “T” junction with FST-317. • Having scrambled up the ridge from just NW of Point 8522, I found no trail (and no remnants of an old trail) on the North Ridge of Sherman Peak. • FST-317 begins at the base of Mill Hollow on EightmileCanyon Road and climbs up to the head of the Mill Fork Eightmile Creek drainage, crosses the ridge eastward and drops southeast to North Skinner Creek. It no longer climbs the North Ridge of Sherman Peak, as the book states. The Eightmile Campground has been out of service for years (“disused” as the Brits would say). It is accessible but is in rough shape. The campsites are overgrown and the road surface is breaking up. There is no sign for it either, but it IS there. I actually camped at the first campsite, which has a decent parking area and two large trees for shade. From the junction of Highway 30 and South 3rd Street in Soda Springs, drive S on South 3rd Street, which becomes Eightmile Road. At 6.4 miles, turn R at an unmarked junction (the road going straight is gravel, not paved). At 7.8 miles, the pavement ends. At 10.0 miles, you enter the Cache National Forest and the road becomes FSR-425/Eightmile Canyon Road. At 11.5 miles, go straight at a road junction on FSR-425. At 13.4 miles, the road passes the site of the old Eightmile Campground. At 13.8 miles, you reach a signed junction with FST-446 on the LHS of the road. FST-446 is an ATV/MC trail. Park at this trailhead or, if the road is too rough for your vehicle, park at the site of the old Eightmile Campground and hike up to the trailhead. The elevation at the trailhead is approximately 6,860 feet. Please note that the USGS topo map for Sherman Peak is wildly inaccurate with respect to road/trails on this mountain. The map fails to show FST-446 and FST-317. It does accurately show Skinner Canyon Road/FSR-403 but it also shows two other jeep road/trails which do not exist (one on the north side of the mountain and one on the south side of the mountain). From the junction of Eightmile Canyon Road/FSR-425 and FST-446, hike eastward up FST-446 (an ATV trail) for just over a mile to a point where the trail turns L/N and begins to descend. The elevation here is 8,260 feet. This departure point is on the NW side of Point 8522. Bushwhack eastward up through aspens and blowdown onto a shoulder that leads up to the W side of Point 8522. Skirt the R/W side of Point 8522 on open terrain with reasonable side-hilling. When the open terrain turns into forested terrain, look for a game trail to follow L/SE up over a minor saddle at the base of the S ridge of Point 8522. You are now on the North Ridge. Bushwhack S across a meadow then follow the ridge crest SE for a brief section. The ridge bends R/S and continues in a southward direction all the way to the summit. You will find a game trail, on and off, near the ridge crest. Skirt the R/W side of Point 9366 just below the forest line. Return to the ridge crest on a nice, diagonally-upward game trail. The open terrain on the North Ridge is mostly grass, but there are some sections of sagebrush and other desert scrub (sometimes thick) to navigate through. The saddle between Point 9366 and the summit is wide and open (easy field grass). Once past the gentle saddle, follow a weak game trail up through a short section of easy forest. The forest disappears and, from here, it is easy open terrain to the summit. Stay on the L/E side of the ridge crest for the easiest going (on a combination of scree and short scrub). The summit of Sherman Peak has a massive, wide cairn (a rock pile, really) and a USGS BM in a nearby ground boulder. It also has a tall wooden post and an old wooden Forest Service communication box with a rusty metal phone structure/case inside. The communication box is secured to a steel post. The views from the top are magnificent. Same as for the West Face/North Ridge Route. This descent is part of a ridge traverse from Sherman Peak to Peak 9212. The easier, more direct access to the South Ridge is via Skinner Canyon Road/FSR-403, which skirts the east side of the base of Sherman Peak’s South Ridge in an open meadow at 8,800 feet. From the summit, descend the South Ridge (more of a face initially) on a mix of gravel/scree, short scrub, sagebrush, and scattered trees. This descent is a bit loose initially. 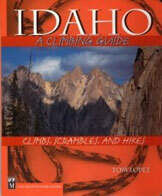 You will find a game trail near the ridge crest to help you in your descent. The terrain is more open on the L/E side of the ridge crest, but is rockier and more angled there, so stay near the ridge crest or on its R/W side. The forest on the R/W side is relatively open and is not too thick. After crossing a minor saddle at 9,317 feet, ascend 40 feet (vertical) up over a ridge hump. From this hump, descend S rapidly to the more important, and lowest, saddle between Sherman Peak and Peak 9212. The terrain in this section of the descent is a mix of forest and open veg; a game trail will help expedite your descent. This saddle is relatively narrow and has a large open meadow on its E side. Skinner Canyon Road cuts through the open meadow but does NOT cross the saddle. The elevation at this saddle is 8,780 feet. This is the terminus of the South Ridge of Sherman Peak.